Zeon 8 is designed for small off-road vehicles and has a pulling force of 8000 lb(3,630 kg). The body of the model is made of cast aluminum and covered with black powder paint, and the fasteners, as well as the clutch lever, are made of stainless steel, which in addition to its excellent appearance provides a reliable corrosion protection. 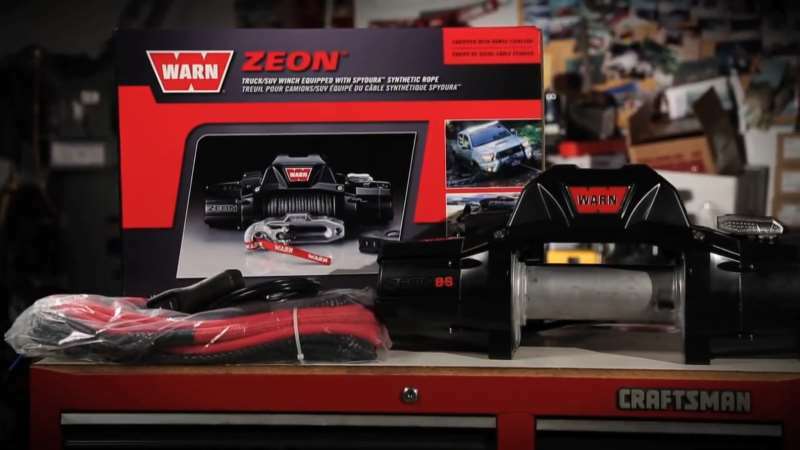 The versatility of the WARN Zeon 8 winches is ensured by the possibility of mounting the control unit both on the winch itself and in any other convenient place, it is enough to purchase a control unit transfer kit that is sold separately. You can choose the transfer unit for both small distances – 80 cm, and for large distances reaching up to 2 meters. This winch model is equipped with a transmission and a Series-Wound engine, which provides quick and quiet operation. Which Features Help Warn Zeon 8 Stand Out? Zeon 8 belongs to the Zeon Series, which formula of popularity looks like this: increased power plus increased reliability plus extremely stylish design. Check out the characteristics, which you will definitely benefit from using Zeon 8 winch offered by the trustworthy American brand, which is by right the leading producer of off-road accessories. The model is equipped with a steel cable with a galvanic coating 30.5 m long and 8 mm in diameter. 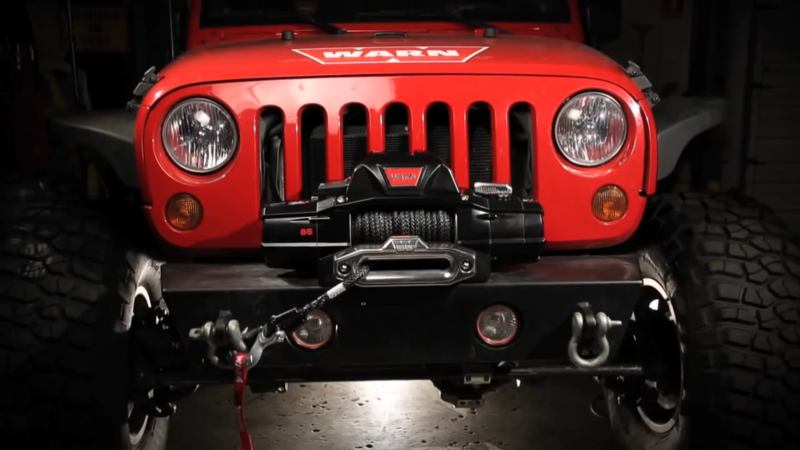 The winch is intended to be used for the harshest operating conditions. The design of the aluminum-zinc alloy has increased heat transfer. The improved seal system makes it impossible for water and dust enter the winch body. Also, Zeon 8 winch is equipped with a lightweight large diameter drum, which reduces wear on the rope. An anchor attached to the cable will provide a simple fixation of the cable for a tree or other fixed object to pull your SUV out if you face an unexpected trouble. There is a steel cable with a protective galvanic coating included in the kit. The control unit can be mounted not only on a winch but on any other place that you consider to be the more suitable one. The universal installation of the winch (a control unit transfer kit is required, you should buy it separately). The model can boast with the upgraded transmission. The Series-Wound ™ engine provides fast, reliable and silent operation of the winch. The body is covered with the black powder paint, which adds a stylish touch to the winch and has a protection function. The fasteners and the clutch lever made of stainless steel, which guarantees that your car will get an attractive look together with the 100% protection from corrosion. The improved gland system helps to feel free from worries as neither water nor dust will come to your winch during the winching process. Numbers always speak more than words. It is possible to tell about the high performance and speed of a winch much but the specifications of its performance can show everything visually. Is Zeon 8 Your Perfect Match? 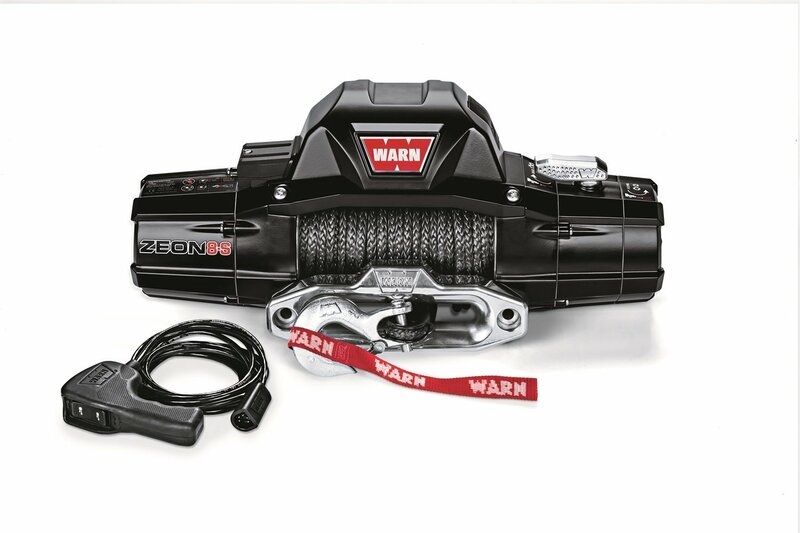 If you are looking for a steel powerful winch for your vehicle, then an electric Warn Zeon 8 is worth your attention. It is an accessory from the premium series made by the famous brand, which means that it will show great performance when you find it necessary. Who will be able to resist getting a combination of elegant body with high power? The answer is obvious. Each owner of SUV would be glad to see Zeon Series winch as the helper for emergency situations. Electric Winch Zeon 8 has a pulling force of 3026 kg (8000 pounds) and, at the same time, fast speed, which are the most important criteria when choosing a winching device. It has a well-thought-out design: the operation of the winch is very simple, the design is reliable – this model will last you for many years. The external control unit of the winch can be installed together with the winch itself, as well as optionally separately – this gives more options for installing the winch and its final appearance (note, the transfer kit is sold separately). Of course, it is worth noting the appearance of the winch. It is universally accepted that all Warn winches are characterized by a favorable, neat appearance. The presented Zeon 8 auto-winch is not an exception. The case is covered with a glossy black powder coating, all fasteners and parts are made of stainless steel. It really looks perfect. Warn Zeon 8 is an excellent version for Chevrolet, Subaru Forester, Jeep Wrangles and other Jeeps and SUVs. If you are still considering if this winch is worth your money, remember that it is equipped with all the necessary off-road functions, from overheating protection to a very smooth planetary gear. 8,000 lb. pulling capacity combined with quite a good speed is an excellent choice for off-road lovers who want to make their adventures much more enjoyable and safe.